The time came to make a change away from the TVS2300. I had broken 2 jackshafts and Magnuson said they would not warranty another. 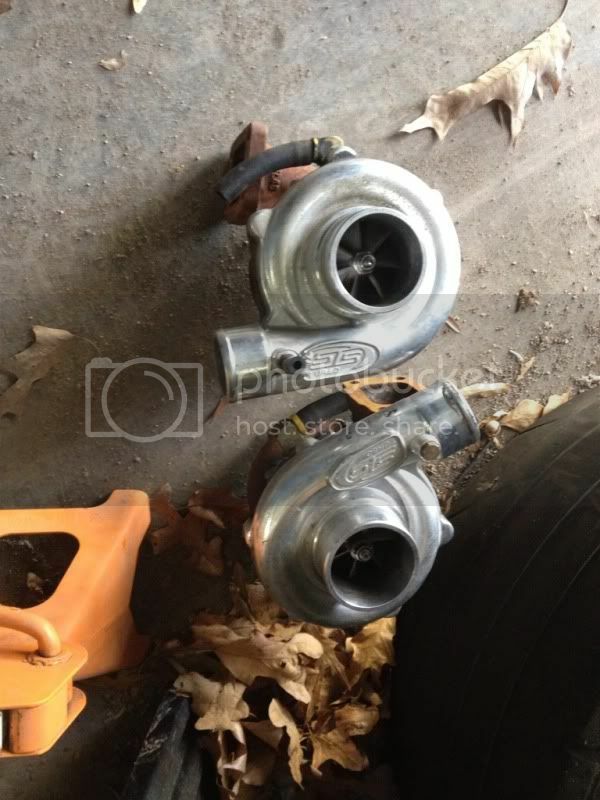 I talked with a Grrrr8.net board member and purchased his Twin Turbo STS upgraded kit to see if not only I could make more power but do so without part breakage. I sold the TVS to a guy in Dallas and I installed it on his car for him. He intern paid for the Turbo kit to be shipped down to me. After much pain installing the kit due to aftermarket exhaust and headers I came up with a solution to make it work. I still have to clean up some oil lines and some wireing to make it truly look clean but I want to get the car up and running and get her tuned. I drove to ETMC and we were getting her ironed out. The car was hitting a wall at 6200 that looked like it was dropping a cylinder. I hoped for the best but I knew in my heart the engine probably needed a refresh. We pulled the valve covers and inspected the springs hoping that was all it was. NOPE, we did a compression test and found all cylinder were 140/150 but that number 7 was 100 and 5 was 120. Like I said I knew the motor was hurt.......when the shaft broke at the ECS we pulled the plugs and notice 7 was destroyed. I put new plugs in and the car ran and drove without missfiring or anything like that. Well onto where we stand now. The car is at ETMC because I am tired of doing the labor on my car at this point so I am letting them pull the motor and have it refreshed. They are pulling it apart tomorrow supposedly and we should find out what the exact issue is. Then it will be dyno time and shooting for 800rwhp at 15psi and get that 9 second pass. exhaust note video was before tune day when we found compression issue. She put down 680rwhp at 11psi before we found the compression problem. After that each pull the car made less hp so we knew we had to search for the issue. Glad we found it. If I was not so burned out on the car I would have pulled it my self and save several hundred dollars but at least I know it will be done right. 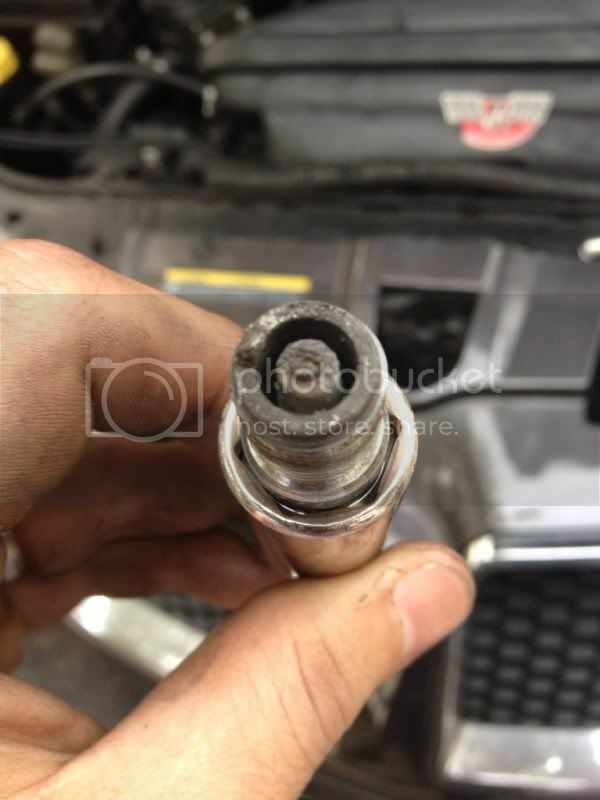 Isn't this the second motor in your G8 already? I hope it's not something major. Stock motor was swapped for the 418, and now I have to refresh the motor. Not a new engine or full rebuild just a little work. Are any aussie tt kits available? I know aps had some at one point... Good luck with the build. If you need any custom plumbing, let me me know if I can be of help. Aps will not sell to states anymore for g8 or GTO. GenTrr will and I am the only US distributor. I got the sts kit about 2k cheaper then even I can get the genttr kit at wholesale. Sts kit is complete on my car and motor seems to be fine. We are putting in new bearings and better oil pump just as insurance. Should have back together in week or two. Block will go to machine shop to be inspected. Im severaly disipointed in magnason,im ready to do something different the new owners are running that company in the ground.I wish you luck on the new build i dont think you can go 9s on turbos alone but i hope you reach your goal.If you need anything from us give me a call. Since I am flat broke after the motor fiasco I dont have the ability to even take you up on discounted offers I would love a larger TB but I cant afford it. You have always been good to me Thomas and I will continue to send business your way. Let me know what FI you are going to be pushing and I will get the word out. Thanks,you wont need a tb with the turbos i dont think its worth the money,on maggies its much needed but thats really about it.You may need some axles tho lol! Crap happens. I didn't have to pull the motor but decided I wanted it perfect. Damn, it never ends does it? GL with the new build... look forward to some video when its done!